A great post, Linda. Thank you for the reminder that humility wears much better than self-righteousness. Thanks Christa. I’ve been thinking the same thing. You’ve said this so well. Thank you. Thank you Grace – and thank you for taking the time to visit my blog. Excellent post Linda. I agree it’s so much more comforting to think that people are responsible for their own misfortune than to believe it could happen to you. Linda, well stated. You speak for many, I am sure. Thanks for saying what I’ve thought (in part). I often follow conversations on Facebook and watch the viewer comments on the news (HLN). I am astounded(?) at the cruelty of some people. And the stupidity. Every single thing we each do for another living creature only helps the world as a whole – it heals our collective soul. Hate just makes the place sour. Being able to feel compassion for another person does not make us human – humans can be far too unfeeling. But, what is it that we become??? Just better, I guess. Thank you for stopping by and reading. It makes me glad to know that I am speaking not just for myself, but for people like yourself. The Christian right is a scary institution, and to think they have influence on US public policy is more than frightening. Such outrageous commentary by Pat Robertson is unconscionable. If humanity cannot feel compassion for those who suffer, then we are no more advanced than animals. Thank for stopping by Carla. I agree with you. His ridiculous explanation foir things sounds like something that would have been said thousands of more years ago, with the only motive being to incite hatred towards another group of people and maintain power. Reminds me a lot of biblical times. I wonder why he can’t see the parallel? IT is human to judge others until one day great misfortune befalls on us. I think in times of such tragedy the only thing one can do is to help. Help is only thing that can be done at this moment. 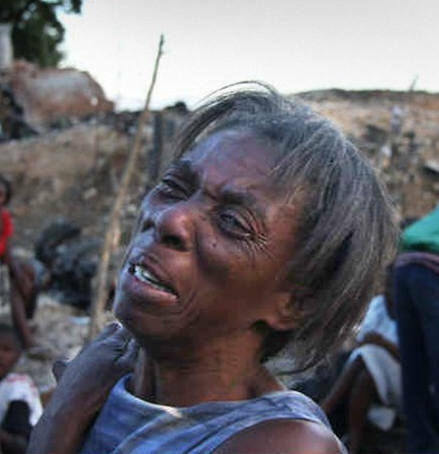 If we are to blame someone for the condition of Haiti in any way then we only need consider the actions of our ruthless and greed filled leaders of governments and corporations of this world. As for the religious morons with such short sightedness they are at the top of the list of evil on this planet. The above are my views in short about the circumstances befalling our little planet and ignorant lives. I agree artidlemagic. Thank you for taking the time to read and comment. namaste – the divine in me recognizes the divine in you. it sounds airy-fairy, granola, yoga, but as individuals we have no right to expect to be treated with dignity and respect if we aren’t treating others that way. If we aren’t thinking of everyone that way. Well-said, Kristin. Thanks for stopping by.